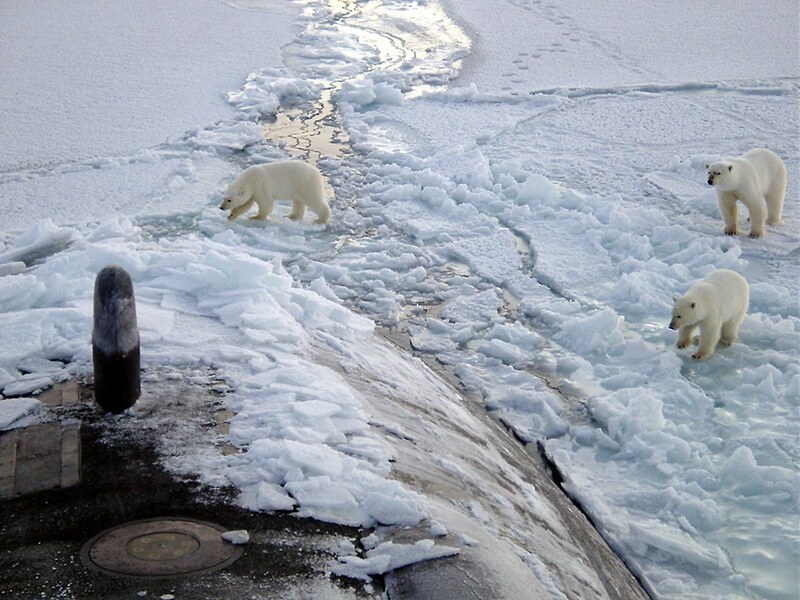 Polar bears investigate the USS Honolulu 28 miles from the North Pole. Credit: Chief Yeoman Alphonso Braggs, US-Navy. Arctic sea ice volume just reached its lowest on record ever for early July. This according to data and modelling from the University of Washington Polar Science Center. Sea ice is an important climate indicator. It’s composed mostly of frozen seawater and forms at lower temperatures than freshwater—at or below -1.8 °C/28.8 °F. Typically in the Arctic, sea ice ages and thickens from winter to winter. Most scientists agree that perennial ice cover in the Arctic dates back at least 700,000 years. Some calculate 4 million years. These days it’s thinning and disappearing. 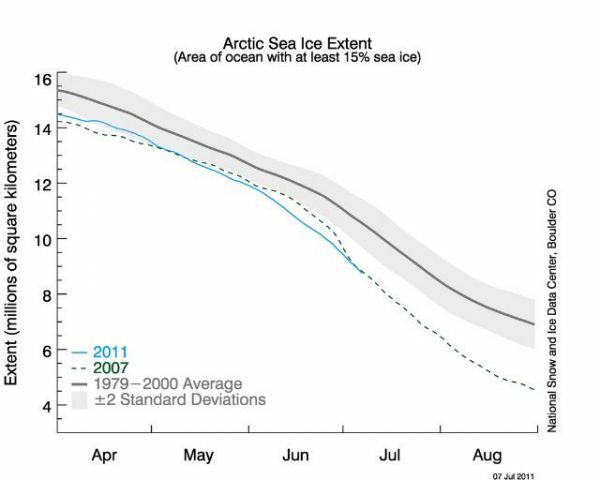 I wrote in February about how bad the 2011 winter Arctic sea ice was looking—and how poorly this boded for our current summer ice conditions. 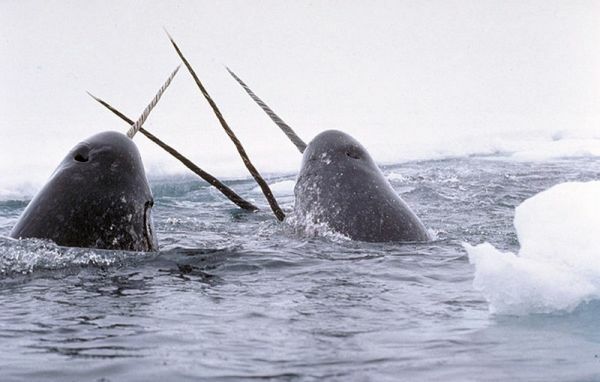 Narwhals tusking. Credit: Glenn Williams, NIST. In 2003 NASA predicted perennial ice could be gone by the end of the 21st century. Since then, the melting continues to accelerate faster than the models can keep up. Sea ice volume… depends on both ice thickness and extent and therefore more directly tied to climate forcing than extent alone. However, Arctic sea ice volume cannot currently be observed continuously. Observations from satellites, Navy submarines, moorings, and field measurements are all limited in space and time. The assimilation of observations into numerical models currently provides one way of estimating sea ice volume changes on a continous basis. Volume estimates using age of sea ice as a proxy for ice thickness are another useful method (see here and here). Comparisons of the model estimates of the ice thickness with observations help test our understanding of the processes represented in the model that are important for sea ice formation and melt. You can see how this year’s sea ice extent dipped below the record-low 2007 extent a few days ago. Here you can see how last month—June 2011—sea ice extent was reduced by 47 percent, nearly half, compared to its maximum in 1979. That’s when we first began examining these things via the eyes of satellites. 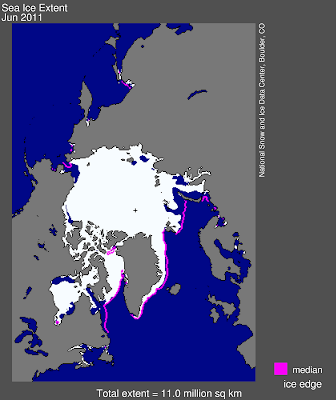 Arctic sea ice extent for June 2011 was 11.01 million square kilometers/4.25 million square miles. The magenta line shows the 1979 to 2000 median extent for that month. The black cross indicates the geographic North Pole. The latest surface analysis from Environment Canada shows a 1039 mb high pressure system centered north of Alaska, which is bringing clear skies and plenty of ice-melting sunshine to the Arctic. The combined action of the clockwise flow of air around the high and counter-clockwise flow of air around a low pressure system near the western coast of Siberia is driving warm, southerly winds into the Arctic that is pushing ice away from the coast of Siberia, encouraging further melting. This pressure pattern, known as the Arctic Dipole, was dominant over the Arctic during June, leading to June having the 2nd lowest extent on record, and the record low extent observed at the beginning of July. The Arctic Dipole began emerging in the late 1990s, and was unknown before then; thus climate change is suspected as its primary cause. The Arctic Dipole has become increasingly common in the last six years, and has contributed significantly to the record retreat of Arctic sea ice. 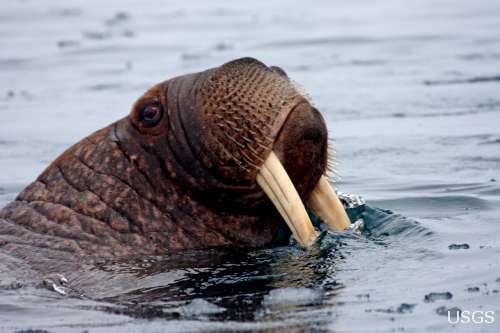 Walrus in the Chukchi Sea. Credit: Sarah Sonsthagen, US Geological Survey.